What's going on at Boswell, in between the snowflakes. Note that Wednesday and Saturday are two days this week where no precipitation is expected. Former professional football player and current Assistant Professor of Clinical Research and Leadership at George Washington University, Robert W Turner II traces the career trajectory of NFL players before and after their time in the league. Turner will read from his book and then participate in a conversation with former Wisconsin Badger and NFL running back Montee Ball. The NFL is the most popular professional sports league in America, but for players, making it to the league is not about the promised land of fame and fortune. Turner II draws on his own experience and interviews with current and former NFL players to reveal what it means to be in the league and explain why so many struggle with life after football. Retirees experience financial ruin, live with chronic pain, and many find themselves on the wrong side of the law. With little job security and few health and retirement benefits, Turner II argues that the fall of so many players is no accident. The NFL powerfully determines their experiences in and out of the league, and the process of becoming an elite football player leaves athletes with few marketable skills and little preparation for their first Sunday off the field. Robert W Turner II earned a Ph.D. from City University of New York and is Assistant Professor of Clinical Research and Leadership at George Washington University. Dr. Turner played football professionally in the now defunct United States Football League, the Canadian Football League, and the National Football League. 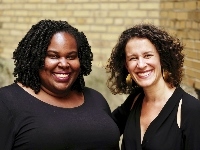 Newbery Honoree and Coretta Scott King Award winner Renée Watson teams up with poet Ellen Hagan at MPL’s Washington Park Branch to present this YA feminist anthem about raising your voice. Perfect for adults and teens 13 and up. Jasmine and Chelsea are sick of the way women are treated even at their progressive NYC high school, so they decide to start a Women's Rights Club. They post everything online - poems, essays, videos of Chelsea performing her poetry, and Jasmine's response to the racial microaggressions she experiences - and soon they go viral. Renée Watson is the Newbery Honor and Coretta Scott King Author Award-winning author of the novels Piecing Me Together, This Side of Home, and Betty Before X, co-written with Ilyasah Shabazz, as well as the picture books Harlem's Little Blackbird and A Place Where Hurricanes Happen. Watson is founder of the nonprofit I, Too, Arts Collective. Ellen Hagan is a writer, performer, and educator. Her latest collection of poetry, Hemisphere, was published by Northwestern University Press. Minneapolis author Karen Babine, winner of the Minnesota Book Award, appears with her new memoir, All the Wild Hungers, an affecting chronicle of one family’s experience of illness and of a writer's culinary attempt to make sense of the inexplicable. When her mother is diagnosed with a rare form of cancer, Babine can’t help but wonder: feed a fever, starve a cold, but what do you do for cancer? She commits herself to preparing her mother anything she will eat, a vegetarian diving headfirst into the unfamiliar world of bone broth and pot roast. Karen Babine is author of Water and What We Know: Following the Roots of a Northern Life, winner of the 2016 Minnesota Book Award for memoir/creative nonfiction, and a finalist for the Midwest Book Award and the Northeastern Minnesota Book Award. She also edits Assay: A Journal of Nonfiction Studies. She holds an MFA from Eastern Washington University and a PhD from the University of Nebraska-Lincoln. More on Boswell's upcoming events page.